PredPol, a cloud-based, data-driven crime prediction service, predicts place-based prediction boxes as small as 500' x 500'. 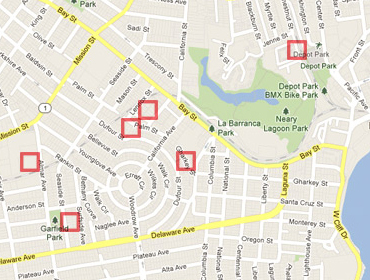 Officers are briefed daily on these zones in which crimes are most likely. "When I joined the crime modeling group at UCLA, I started to work on similar types of optimization problems, but applied to spatio-temporal crime patterns. We had a large dataset provided by the Los Angeles Police Department and I was interested in understanding the statistics of crime hotspots and how they could be predicted. " "Some of the models we use at PredPol are self-exciting point processes that were originally developed for modeling earthquake aftershock distributions [Marsan and Lenglin, 2008]. The fact that these point process models fit earthquake and crime event data quite well is, by itself, a cool result. However, in the context of policing we can actually send police into the hotspots that we predict in order to prevent crime. So not only does predictive policing present an interesting modeling problem, but the models then have a societal impact that can reduce the risk that one's car is broken into or that they are a victim of gun violence." "We have run randomized controlled trials to measure accuracy of the PredPol algorithms and impact on crime rates. These are necessary, because without them it is impossible to determine whether a crime rate increase/decrease is due to the technology and its use or because of some exogenous factor. But my favorite examples are at the scale of individual hotspots. For example one agency had a guy stealing cars with a tow truck. So the police put a decoy car with a GPS tracker in one of the PredPol hotspots and sure enough he came and towed it away (and the police were able to catch him)." In the gloomy half-darkness the three idiots sat babbling. Every incoherent utterance, every random syllable, was analyzed, compared and reassembled in the form of visual symbols, transcribed on conventional punchcards, and ejected into various coded slots. From PredPol and Self-Exciting Point Process Modeling of Crime (pdf) via Data Science Weekly via Frolix_8.